It was just Christian Ingebrigtsen, Mark Read, and Ben Adams who performed that night; I don’t know what’s the catch, but I’ve heard that Paul Marrazi had long left the group. Anyway, I was so amazed on how they have grown from a charming boy group to a real-life band with instruments and all!! The a1 fever was so overwhelming that it made me miss my grade school and high school days. There were screaming before, during, and after each song! It’s really crazy! The group was so thoughtful that they really made the effort to perform all their hits for the fans. I was made nervous by the opening video wherein a teasing ‘R U READY FOR a1’ was flashed followed by a recorded polyphonic performance they made (which I did not understand because I was so busy screaming and looking for them!) and then a countdown leading to seemingly an explosion — and then when the lights lit, they were already on stage singing ‘Same Old Brand New You’. Super cool!! The boyband fever was so alive as they sang their past hits Be the first to believe, Take on Me, Everytime, Ready or Not, One More Try, Living the Dream, No More, Heaven by Your Side, One Last Song, Like a Rose, Caught in the Middle, and some new hits from their latest album Waiting for Daylight: Take You Home and In love and I hate it. Their version of Lady Gaga’s Poker Face and Black Eyed Peas’ Tonight’s gonna be a Good Night was indeed a revelation. They claim to have acquired Filipino names during their short stay, that’s Macoy for Mark, Chan-Chan for Christian, and Bentoy for Ben. I think its a bit corny now but I remember finding it so cute that night. Haha! 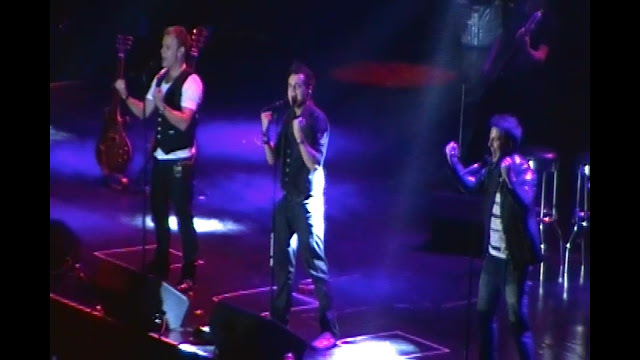 A1 was awesome on stage, the years really did good to them. They seem to have not aged one bit and their music was amazingly still in the hearts and minds of their fans.